In Medias Res: Songs of '78: "Time Passages"
Songs of '78: "Time Passages"
"Time Passages," the first song released from--and the first song in the track listing of--Al Stewart's album of the same name, is probably responsible, more than any other single song, for this list's existence and my constant return to pop music and the radio for four decades of life (so far). It was the first piece of music I ever purchased (a tape cassette, the other songs on which I can barely remember, but which I destroyed from years of listening to this one song and then rewinding and listening to it again, probably hundreds of times over the years), and no other song from my early radio-listening years has stayed with me so constantly, being renewed in my memory in association with dozens of particular moments. I can remember thinking about "Time Passages" while watching clouds drop lower along the Wasatch Mountains just east of BYU's campus in Provo, UT, while I was there as an undergraduate. I can remember thinking about it while driving a moving truck along a mostly empty Ohio interstate, late in the afternoon, with my then-new wife and an old friend asleep in the front seat beside me. I can remember thinking about it while holding Melissa's and my first child--Megan, then about 10 days old and asleep in my arms--as I sat on the futon in our second apartment in Washington DC while I was in graduate school, and wondered: what the hell have we gotten ourselves into? I remember this song so damn much. Why? What is it about this jazzy, lyrically folky, smooth piece of 70s soft rock that enabled it to send roots deeper into my musical consciousness than probably any other song I have ever heard? Hard to say. Maybe it was because, on some level, even as a 9 and 10-year-old, my consciousness was tuned to reflection and regret. Even as a little kid I was weirdly conscious of the passage of time--not in a morbid way, but one that left me thinking about how all was transitory; that there was always going to be another thing after this one. I suppose the mature Christian belief I hold to today, the faith that there is a God who is the Author of our existence--and that, as such, everything I say or do is secondary, an addendum, to the real business of my being here, which is by no means tied to any particular work I may do--was perhaps fated. Maybe I was bound to end up thinking this way, because I was the sort of person who, as a child, could hear a simple romantic lyric of longing like "The things you lean on are the things that don't last," and think to myself: oh yeah, that's the truth. Oh well. Who knows? 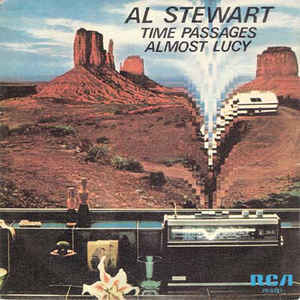 Forty years ago on this day, Al Stewart released a song, and it's a beautiful one, whether it makes your mind run deep or not. There was no video for it, but this live concert footage is wonderful. The fact that Stewart, at the conclusion of this passionate rendition of his humble little song, promises to be back in 20 minutes and then just causally walks off the stage fills me with a kind of bittersweet delight. Just about a perfect exit, says I. Would that we all could do the same. I love this song, but whenever I sing it, it turns into Wildfire. Songs of '78: "Le Freak"
Songs of '78: "Beast of Burden"